A Grasshopper Sparrow nest at one of FMRs restoration sites. 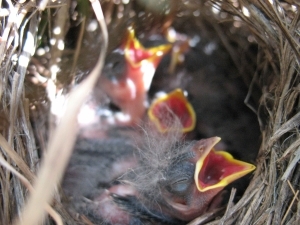 Walking on a prairie at this time of year is risky business  especially for baby birds. 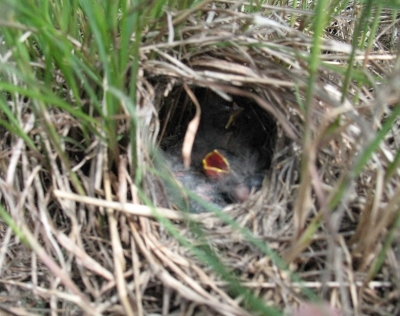 Many prairie bird species nest on the ground, a reasonable choice given the general lack of trees on a prairie. Grasshopper sparrows and lark sparrows build grass nests that are amazingly well hidden, even in fairly open grasslands such as dry prairie. A woven grass nest placed under overhanging grasses is so well concealed that it can be hard to find, even when you know where it is. Mourning doves typically build nests in trees, but occasionally they nest on the ground, where weve nearly stepped on the perfectly camouflaged chicks, housed in a very loosely arranged stick nest. The drab-colored babies are well-camouflaged. Grasshopper sparrows also tend to stay fairly concealed as adults. Most often seen just as theyre diving into the grass, the males do offer rare glimpses of their rather stubby form when they sing from perches. After hearing their non-musical, insect-like trill, its easy to understand the origin of their name. But the name also refers to the dominance of grasshoppers in their diet. 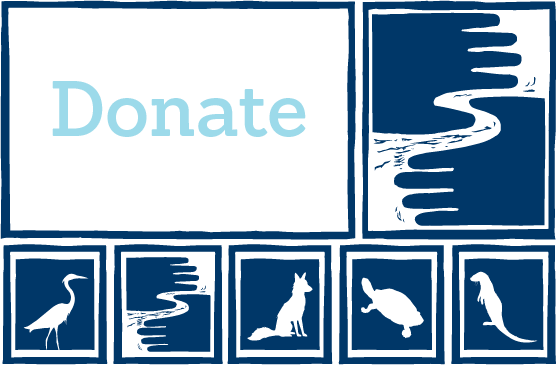 Due to dramatic loss of habitat, grasshopper sparrows are listed by the Minnesota Department of Natural Resources as one of the species of greatest conservation need. Grey Cloud Dunes SNA and Hastings Sand Coulee SNA are two sites in the Twin Cities where you can find this and other prairie bird species. 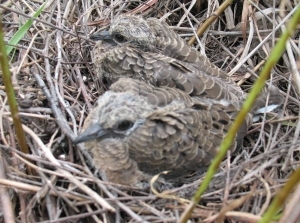 Mourning dove chicks at the Sand Coulee SNA. 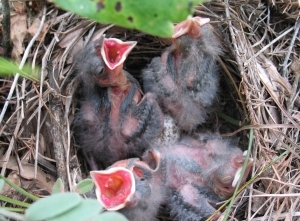 A closer view of Grasshopper Sparrow chicks.